Special Containment Procedures: The Foundation is to sponsor forklift certification programs in the cities of New Orleans and Chicago. These programs are to purposely include faults, such as safety misinformation and incompetent teaching. Civilians entering these programs are to have their backgrounds checked for previous forklift certification that was previously revoked. Subjects meeting these conditions are to be interviewed for possible information pertaining to SCP-4048-1 and then given Class-A amnestics. Description: SCP-4048 is a circular object approximately 37 meters in diameter. SCP-4048 is capable of indefinite flight and complete invisibility. As such, it is extremely difficult to observe SCP-4048 outside of Delta Events. SCP-4048 is believed to host a number of extraterrestrial organisms aboard. Target is employed at a warehouse in either New Orleans or Chicago. Target regularly uses a forklift in the course of their occupation. Once the target enters REM sleep, they will spontaneously disappear from their residence for a period of time ranging from 30 minutes to one hour. This is the only time that SCP-4048 is observable to the naked eye, above the residence of the target. Afterwards, they will remanifest in their beds. Targets claim to remember being awoken inside of an interrogation chamber and questioned about their tenure as a forklift operator. This interrogation usually includes questions about their performance, their efficiency, their usage of a forklift in the workplace, and their knowledge of forklift operation. After this interrogation, the target will reappear in their beds. After Delta Events, approximately 63% of targets will have their forklift certification voided by an unknown source. In addition, all evidence that the target was ever forklift certified will be voided in some way during this event. Interviewed: Mr. Cole Peterson Jr.
Foreword: Mr. Peterson was the target of a Delta Event, and came to a Foundation-controlled forklift certification service. Researcher Calvin: Good morning, Mr. Peterson. Could I offer you a drink? Mr. Peterson: Yeah, yes, I'm parched. Can I get a water? Researcher Calvin gives Mr. Peterson a cup of water. The water is laced with mnestics, as it was thought at the time that SCP-4048 was an antimemetic anomaly. Mr. Peterson: Thanks. So, whadd'ya want to talk about with me? Researcher Calvin: We'd like to talk with you about an incident that occurred on the 4th of June, 2013; two days ago. Mr. Peterson: Now, whadd'ya- hey, now that stuff's none of ya' business, ya' hear me? Researcher Calvin: Anything that you say here will be kept confidential. We are willing to offer financial compensation for your information. Mr. Peterson: I'm too- alright. Just, just ask me your questions and keep it quick. Researcher Calvin: Could you describe your experience on that night? Mr. Peterson: Yeah. There I am, sleepin' away, when all of a sudden, I wake up in this chair. There's this voice tellin' me to wake up. It was real deep and sounded like a hammer against sheet metal. As I come to, I see that I'm in this room that's all dark and gray. It was all blurry, too; I think I might've been drugged. Researcher Calvin: Who was the source of that voice? Mr. Peterson: I was about to get to that. I look up, and there's some mate who looks like one of the aliens from TV. I wasn't scared 'o' him; I thought it was one of those prank shows, and I didn't wanna react too hard. Researcher Calvin: What did the creature do to you? Mr. Peterson: Nothin'. All it did was ask me a bunch 'a' weird questions about my job. Stuff like "when was the last time you went uphill on a diagonal", or "have you ever moved your forklift when it's in gear". Then he started to ask me some odd questions, like "what energy brake do you put on when you move tangentally" or "what do ya' do when the blue particle lever stops workin'". I swear to God, he was just trying to weird me out. Researcher Calvin: What did the creature do once you were done with the questions? Researcher Calvin: Thank you for your time. Initial set of pictographs produced by SCP-4048. A picture of a gray, ovular object, believed to represent SCP-4048, followed by an arrow pointing to the second circle in a set of three multicolored circles, next to a large yellow circle believed to represent a star. A blue sphere with green on it, believed to represent Earth. This picture is repeated three times. Each iteration has a higher number of SCP-4048 instances surrounding it. This is believed to represent an invasion of SCP-4048. 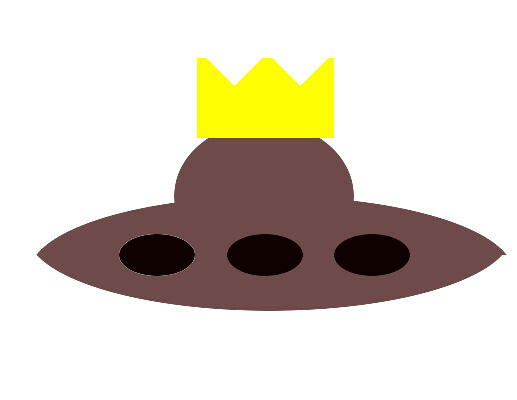 SCP-4048, wearing a gold-colored crown. A forklift being operated by a stick figure, presumably a human. The human is illustrated as being incompetent; they are not in the forklift, but rather clinging onto it as it crashes into a set of boxes. The human is also not wearing a hard hat; rather, it is carelessly holding it in its hand. Recurring "crown" image. Believed to represent SCP-4048 in a position of authority. The same picture as before repeated, but smaller. SCP-4048 is seen in the picture, presumably observing the forklift operator. A red arrow point from this picture to the next: the same picture of SCP-4048 with the crown as before, but with a red "X" over it. This is believed to represent SCP-4048 being denied from a ruling position. SCP-4048 uses some sort of green ray to pull the forklift operator into itself over the series of three images. Then, the forklift operator is seen again, but is operating the forklift competently; he is inside the forklift and is wearing a hard hat. The image is repeated, but this time with a red arrow from the forklift operator to the picture of SCP-4048 with the crown. A green checkmark is overlaid on the crown image.